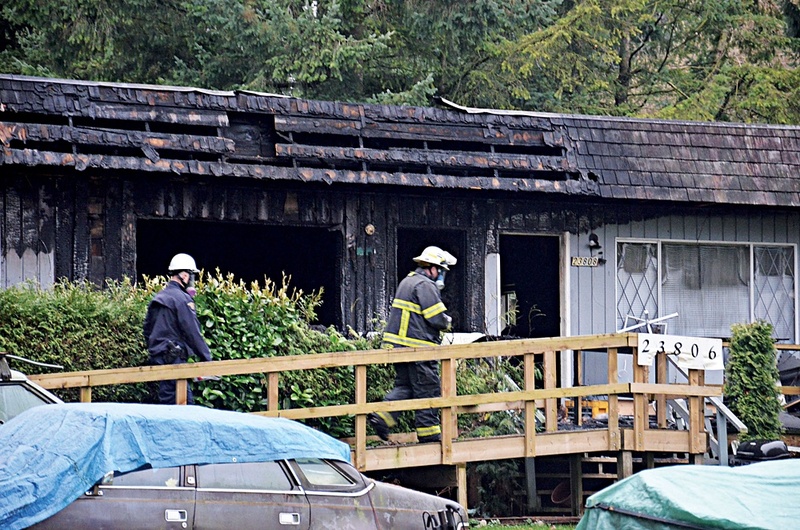 Aug. 18, 2014 9:00 p.m.
Every firehall in Langley Township was called out to bring water to a blaze in a workshop and home in South Langley Monday morning. There were no injuries from the fire that started at Zero Avenue and 204th Street. A workshop, with living quarters above it, caught fire just before 7:15 a.m. The fire began in the living quarters, which suffered the brunt of the damage, said assistant fire chief Bruce Ferguson. Because of the remote location, a tanker shuttle was established, with tanker trucks from all seven Langley Township firehalls bringing in water from the nearest hydrant. The living quarters were rendered â€œuninhabitable,â€ said Ferguson. By his early estimate the building suffered between $250,000 to $300,000 in damage. A high-end convertible Cadillac was in the workshop area, and is now covered with a tarp. It didnâ€™t burn, but Ferguson is not sure how much water damage it may have suffered. Investigators are looking into the cause, but there are no immediate signs that the fire was suspicious. There was no marijuana grow operation or other obvious cause in the building.